From 5M to The End (of SoMa): How does a corporation wipe out an entire community? The light from their eyes was missing; in its place was the color of fear. Lined up, hard-working backs huddled up against the cold white marble walls of City Hall in San Francisco – Indigenous peoples, working people, warriors, artists, mamas, daughters, sons, uncles, grandmothers and grandfathers, from all across Mama Earth, many with roots in the Philippines, waited to speak out against a 21st colonizer Forest City Enterprises, the development company proposing a monster called 5M for their lifelong neighborhood, SoMa, South of Market Street. This was the scene at City Hall last week as the people stood up to behemoth developer Forest City, about to build multiple luxury condominium towers and office buildings that will span almost an entire city block in San Francisco’s long-time Filipino community, effectively wiping out the last shred of this working class community of color. “Building luxury housing is not the answer,” said Raymond Castillo from South of Market Community Action Network (SOMCAN), who has been fighting along with Manilatown Heritage Foundation and other community leaders to stop this desecration of a community. There are many community members and organizers who have stood up to speak out against 5M, but sadly and much more complicated, there have been many people bought out, pimped and played into actually advocating for it. A development of this enormity doesn’t happen without a trail of soul-ed tears. Beginning with the red carpet thrown down for all multi-billionaire developers by the classic hypocrite politrickster Mayor Ed Lee, who garnered credibility with the people when he was part of the struggle to save the I Hotel in the 1970s. But now he works as hard as he can to sell every possible piece of San Francisco to the tourist industry and the ultra-rich. 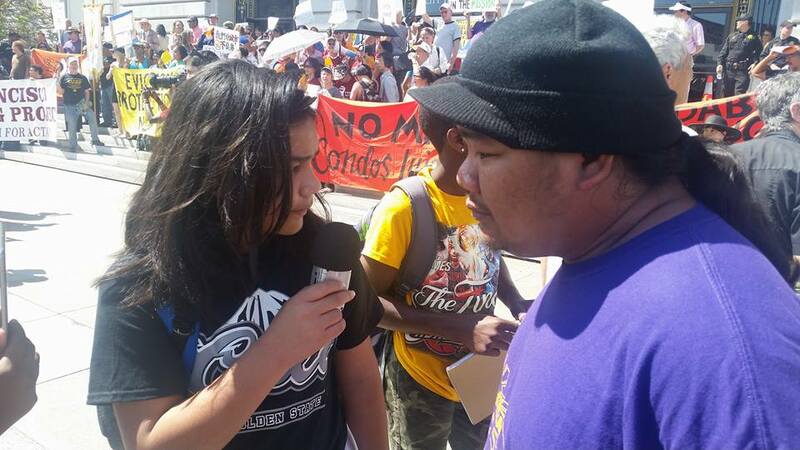 And then there was a young Filipina organizer who was working in the community with people, fighting for housing justice, until the developers wooed her in with promises of who knows what. And then finally, a well-known community organizer, mentor and teacher, threw down completely for 5M, signaling to the broader community a state of massive confusion. The desecration of a community isn’t black and white; it’s multi-colored and it begins with the promise of achieving the murkey, settler-colonial myth that is the American dream, rooted in scarcity models and white supremacy, coded to ensure that we, the working class, poor folks and indigenous peoples are constantly fighting each other and ourselves to stand on the tiny space that is theoretically left for us to stand on. That is why as much as I grapple with this terrifying reality, I don’t blame the souled out community folks who took the dime. For them the die was already cast in age-grade separated schools and capitalist success narratives meted out to every child and family as the measure of success. For these folks, it’s pure self-preservation and success as defined by this hater system. But similarly, I would like people to realize this is a warning. Stop teaching your children the same lie, if even by default. It is up to us as conscious people to take back our own dignity and stop believing and praying to the church of academia and capitalist success. We need to decolonize our minds in deeper ways than just protest and poltrickster maneuvers. Mama Earth and her earth peoples are under attack. The attack on poor, Black and Brown people is even more deadly – and there is not the space nor the resources to perpetuate this culture of wasting and taking, buying and selling our Great Mama (Earth). How long had we known that San Francisco Supervisor Jane Kim was selling us out. This wasn’t her first move in this direction. Big love to Campos, Avalos and Mar, who continued to say no. But to be real, politricks isn’t the answer. You can’t work a little bit with the enemy because they won’t just kill you a little bit. Poor people, working class people, there is another answer: Self-determiNATION. It’s why us poor people, indigenous peoples at POOR Magazine launched the landless people’s land liberation movement that we call Homefulness, modeled after the Zapatistas in Chiapas, the Shackdwellers Union in South Africa and MOVE Africa. It’s why we are working with poor folks in Salinas to launch another Homefulness and other locations across Mama Earth. It’s why we are down to work and share this with any poor people-led movements who are interested. The real first mistake is real estate itself. No one owns Mama Earth, but if anyone has a claim to it other than the first peoples who were colonized off it, it’s the people who worked and lived and struggled to create, build and love it. The working class people of SoMa built SoMa. And in my humble opinion, they own SoMa, just like working class African people “own” the Bayview and working class Raza “own” the Mission. By ownership in this context, I mean equity: decision-making power, resources and self-determined planning. Get woke, family. Stay woke. This is a war on us, and our strategy must change. For them the die was already cast in http://www.juicycoutureoutlet.uk.com age-grade separated schools and capitalist success narratives meted out to every child and family as the measure of success.